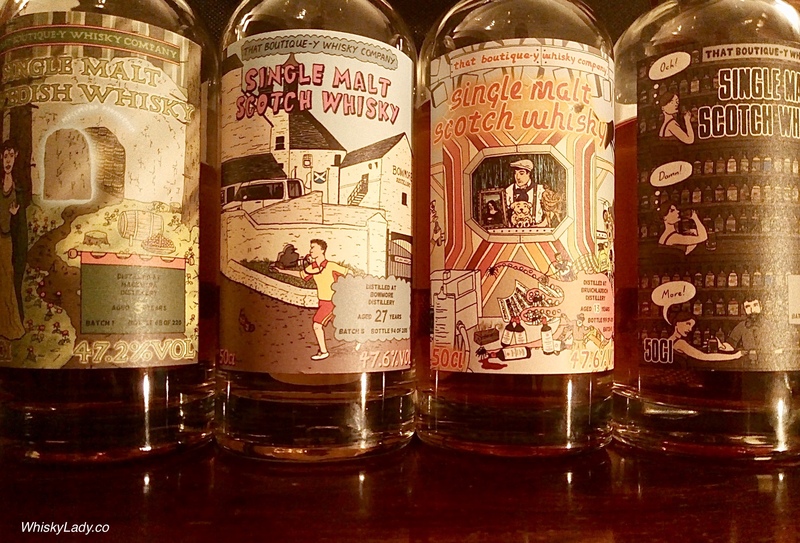 We kicked off our new year with a rather clever range of whiskies from “That Boutique-y Whisky Company“. Our original whisky group general taste blind, and initially on the reveal, you could be forgiven for thinking the theme was to feature whiskies from independent bottler. However the theme taped into substance even more than style… paying tribute to whisky veteran Jim McEwan. With over 50 years of industry experience, he isn’t slowing down and after officially retiring from Bruichladdich is now involved with a new Scottish distillery – Ardnahoe. Where Jim began his career at 15 in 1963 as an apprentice cooper, then warehousing, mashing and malting, becoming cellar master. He then moved to Glasgow to become a trainee Blender in 1976, then manager of The Tannochside Bonding Co (Bowmore facility) in 1978. He returned to Bowmore Distillery in 1986 as the manager and stayed for 12 years. “It was during this time in Bowmore that I started travelling to various whisky events around the world, initially a few times per year but building up to acting as Ambassador and travelling globally about 30 plus weeks per year.” (excerpt from Jim McEwan’s biography). In 2000, McEwan was approached by Gordon Wright who planned to purchase Bruichladdich Distillery together with Mark Reynier and Simon Coughlin. McEwan joined as Master Distiller and Production Director. The work then began to dismantle and reassemble the distillery, keeping much of the Victorian decor and equipment. “The last 12 years with Bruichladdich have been a roller-coaster ride but to see the progress we have made and the friends we have gained, has been the most wonderful experience. To bring this old distillery back from the dead to become 3 times “Distillery of the Year”, 4 times Innovator of the Year plus a host of other awards from around the world has been incredible…. For Bruichladdich to become the cult figure it is, whilst employing so many good Islay people, is for me my greatest reward.” (excerpt from Jim McEwan’s biography). McEwan was the mastermind behind this super heavily peated Islay dram that defies convention. He began distilling Octomore in 2002 and his last (7.1) was released in 2017. With peat levels ranging from 80.5 ppm to 208 ppm, what makes Octomore remarkable – even with all its variation – is its multidimensional character. An Octomore is never merely a peat monster… in fact some of the expressions are outstanding and somehow magically come out the other side of peat to something incredibly silky smooth with no peat punch. And the relationship with Mackmyra? It was a terrific theme and such a treat! This entry was posted in Whisky General and tagged Jim McEwan by Carissa Hickling. Bookmark the permalink.